On December 4, Gabriel Mato-Adrover (MEP, Spain), member of the PECH Committee of the European Parliament, and Blue Fish, the European Association for the promotion of sustainable and responsible fishing, organized an interactive workshop on best practices in selectivity. The workshop brought together around 30 representatives from the European Parliament, Commission and Council to discuss existing programs and techniques that are being developed by marine scientists and fishermen in the EU to improve sustainable fishing and selectivity. The objectives of the workshop were to present, through technical and practical examples, the improvements that were being implemented by fishermen throughout Europe to ensure the sustainability of the fisheries sector. This discussion took place while technical measures, selectivity and discards are some of the issues at the core of the discussions on sustainable fishing, and the TACs and quotas for 2015 will be discussed by the Council in the upcoming week. MEP Gabriel Mato-Adrover opened the workshop and underlined the technical aspect of the workshop, and the interest of fishermen to ensure the sustainability of fish stocks. Exactly because of this reason fishermen have already started to self-regulate and their input are of great importance to policy-makers, as they are the ones who see and know what happens in the sea. Pascal Larnaud, head of Lorient Ifremer station, highlighted three solutions to sustainability: technology, regulations and the selectivity carried out by fishermen. 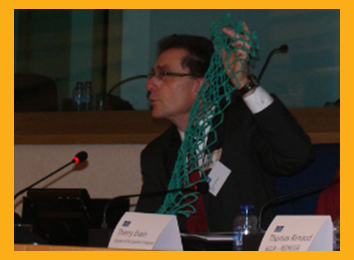 For instance, scientists and fishermen helped improve selectivity by enlarging fishing nets’ meshing. This technique has several benefits, one of which being a reduction in the consumption of fuel. It also diminishes the time spent sorting on the deck, as less fish are caught. Next fishermen and scientists from Scotland, France and Spain all shared examples of best practices in selectivity. Thomas Rimaud, a French fishing expert, and Thierry Evain, a French skipper, presented the REDRESSE programme, a partnership that was established in France, in the Bay of Biscay, between fishermen and scientists, to find technical solutions to improve sustainable fishing and selectivity. Such solutions include working on the size and the shape of the mesh on nets used to catch nephrops (langoustine), with very positive results in terms of discards. Scottish skipper Jimmy Buchan is also involved in testing some practical solutions to improve selectivity. He gave a presentation of his current project, which aims to develop a new net design with a low headline, which allows him to significantly reduce by-catches. Jimmy has equipped his boat with 6 CCTV cameras that allow for strict monitoring and checking of his project. In addition to the excellent selectivity results, Jimmy has also noticed an increase in the quality of the prawns he is able to market, which contributes to demonstrating that selectivity is not opposed to the fishermen’s interest. The presentation was concluded by Luis Arregi, from AZTI Tecnalia (expert technology centre in marine and food research), who gave an interactive account of how net design can be adapted taking into account the natural behaviour and swimming capability of certain species. By adapting to that behaviour, experts and fishermen are able to devise improved fishing methods that lower by-catches, even in multispecific fishery with more than 20 marketable species. Overall, all speakers agreed that fishermen had to find a balance between sustainability and the profitability of their activity. They explained that it is in the fishermen’s best interest to manage stocks in a sustainable way. To do so, European fishermen have already been working to adapt and improve their fishing techniques for a while, often even preceding regulation. You can find documentation on the various projects that were presented during the workshop below. The workshop put forward the everyday work of fishermen, as they pro-actively try to implement self-regulations and best practices in selectivity to ensure greater sustainability of fish stocks. In order for sustainable and responsible fishing to become a reality in Europe, it is important that policy-makers work closely with fishermen and experts, to build on the various projects and tests that they are conducting, while also allowing them flexibility and time to implement new regulations such as the discard ban. This presentation occurred in the context of the upcoming legislative milestones that are the Council’s decision on the TACs and quotas for 2015, and the trialogue between the Parliament, the Council and the Commission on the landing obligations and the discard ban. Blue Fish looks forward to more sessions of this type and to a continued dialogue with the European institutions on how to make sustainable fishing a reality.